Will NASA’s next mission send its astronauts beyond the moon? The space agency is weighing a proposal to build a “gateway spacecraft” a new concept. It would hang in space about 277,000 miles from the Earth and 38,000 miles past the moon — more than a quarter million miles further into space than the orbit of the International Space Station. A report by the Orlando Sentinel details the plan to park the orbiting spacecraft on the far side of the moon, in a precisely calculated spot called Earth-Moon Lagrange Point 2. The gravitational pull of the planets balances out at this point in space, allowing NASA to essentially “park” there permanently rather than orbiting. In contrast, the ISS orbits the Earth at a height of about 230 miles. “Placing a spacecraft at the Earth-Moon Lagrange point beyond the moon as a test area for human access to deep space is the best near-term option to develop required flight experience and mitigate risk,” concluded the NASA report. The new outpost — which may be built from parts leftover from the construction of the ISS — would be an ideal first mission for the heavy lift spacecraft dubbed Space Launch Systemthat is being developed at NASA. That rocket is being designed to carry the Orion Multi-Purpose Crew Vehicle, a capsule that can hold crew on missions to the moon or beyond. It can also carry important cargo, equipment and science experiments to Earth’s orbit and destinations beyond, according to NASA. The Space Launch System will be NASA’s first exploration-class vehicle since the Saturn V took American astronauts to the moon over 40 years ago, the space agency said. A deep-space base or “gateway spacecraft” would present unique opportunities and challenges. It would expose astronauts to the radiation of deep space, and would be challenging to resupply. But it would greatly ease communications further out into space, and would presumably be a jumping off point for human travel to Mars. It was unclear whether this space base would be manned. NASA’s Advanced Exploration Systems Division recently detailed work on a deep-space habitat that would allow crew to live and work safely in space for up to a year. The group built a mockup of such a space habitat in July at Marshall Space Flight Center in Alabama. In a statement to FoxNews.com, a NASA spokesman said the agency was evaluating several potential routes to Mars, an asteroid and elsewhere in space. “NASA is executing President Obama’s ambitious space exploration plan that includes missions around the moon, to asteroids, and ultimately putting humans on Mars. There are many options — and many routes — being discussed on our way to the Red Planet,”Trent J. Perrotto said. Paying for any such a project would be an immense challenge in itself. The Orlando Sentinel reportedly studied internal NASA documents on the project, which don’t include any sort of price tag. And NASA has been wrestling with budget cuts for years. On Saturday, Republican presidential candidate Mitt Romney released a policy paper detailing his vision for NASA called “Securing U.S. Leadership in Space” – it underscores the concept of doing more with less. “A strong and successful NASA does not require more funding, it needs clearer priorities,” the document reads. In February, Space.com obtained NASA memos detailing the formation of a team to develop a cohesive plan to explore the Lagrange point. The first construction flight to build a waystation there could take place as soon as 2019, according to the Sentinel. 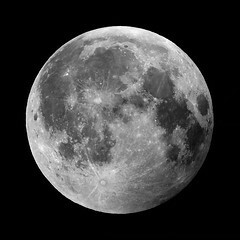 Shine On Harvest Moon Now!